Make sure it’s in the diary! After five years, the £4 million Heritage Lottery and Big Lottery Funded Boultham Park Restoration Project in Lincoln is coming to an end and, to celebrate all that has been achieved in this time, Linkage Community Trust and the City of Lincoln Council are holding an Opening Celebration on Saturday 19th May from 10:30am to approximately 8pm. This day has been chosen as it is very close to the park’s 89th birthday and it is also a special day for many with this being the day of the Royal Wedding of Prince Harry and Meghan Markle and the FA Cup Final. With this in mind both of these events will be shown on a large screen at Boultham Park, and there will be games and activities for young people throughout the day. 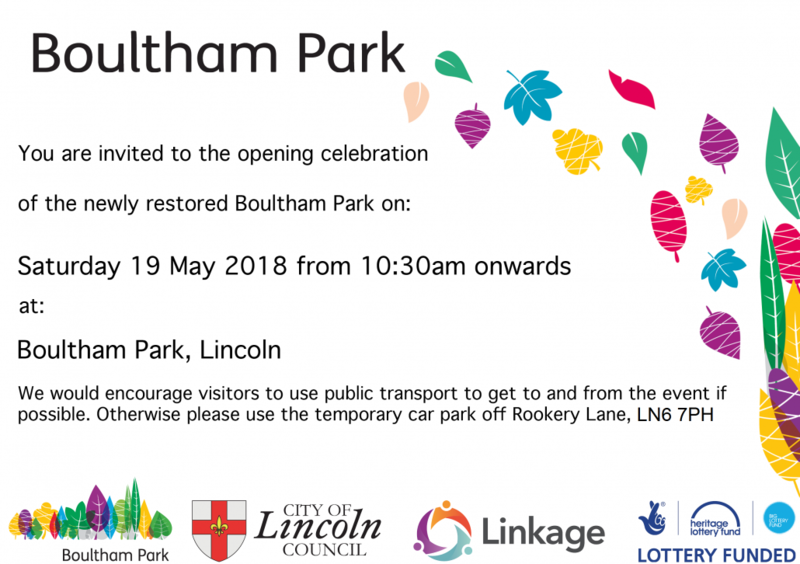 So why not bring a chair or picnic blanket and come along and enjoy Boultham Park? There will be food vendors and the Boultham Park Café and Glasshouse will also be open for the day. If you do need to drive to the park there will be limited parking available on the lower grass section of the park accessed from Rookery Lane. The 1920s Come Roaring Into The Park! Design A Cake Competition!